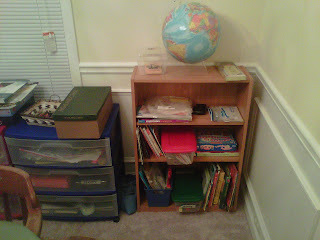 Well Trained Homeschool: New Homeschool Room!! So we just moved from an apartment to a nice townhouse with upstairs downstairs. Yeah, I am so excited!! We have a little more space and we have a garage and deck on the back which we didn't have at our last place so I really have been enjoying homeschooling in our new space. 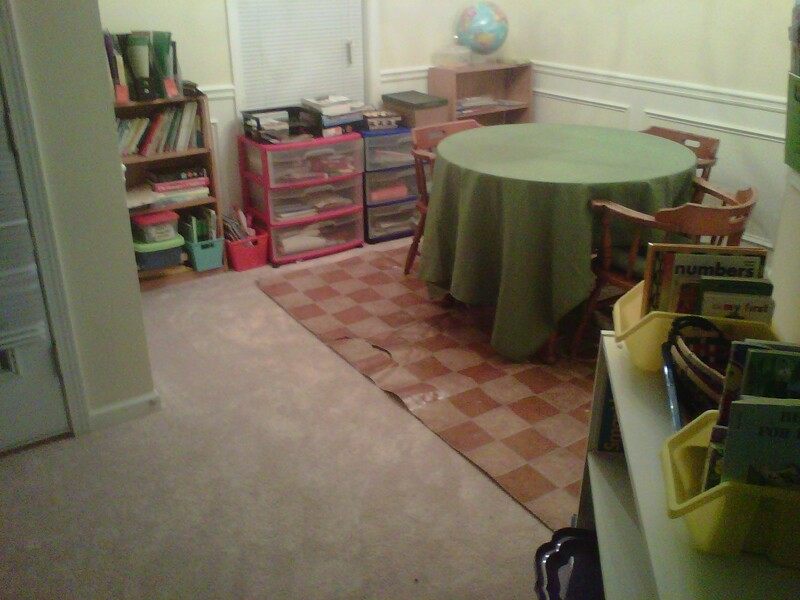 But we still don't have an extra bedroom or family room or basement to dedicate to homeschool but we have made a great use of the dinning room space. I just wanted to share some pics with you of how I set things up. 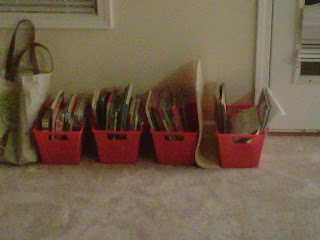 This year each child has there own bookshelf with school related books and a bin for there library pics. They oldest two also have a plastic drawer tote for extra notebooks and art supplies and paper. My toddler has her own shelf as well with her board books and some montessori friendly items on her shelf so she feels included in on the schooling as well. Makes for an easier day when toddlers have something to do as well. So here they are. Tell me what you think? I love it and am drooling over it. We have the space....if I could convince DH to let me turn the guest bedroom into it...but we would seriously need book shelves etc, and living in on this remote island in the Bering Sea, well that is no easy task. Most places wont ship here and those that do it is prohibitively expensive....although I am on the lookout for bookshelves, etc at garage sales. Fingers crossed. Yours looks great! Congrats on the new space. Oh I'm a little jealous, I really wish we had a school room, right now there's a little here and a little there. Our place just doesn't have the room (5 people in 720sq ft), we have a nice yard but lack the inside space. 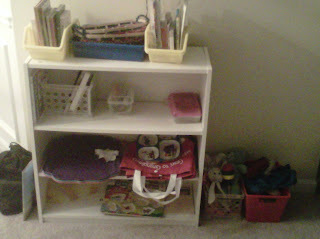 I really like to low shelves so even the little one can reach. Oh, Len er are soon to be a family of 6 living in a 2 bedroom townhouse. We are blessed that my husband lets us convert the dinning area into our space. 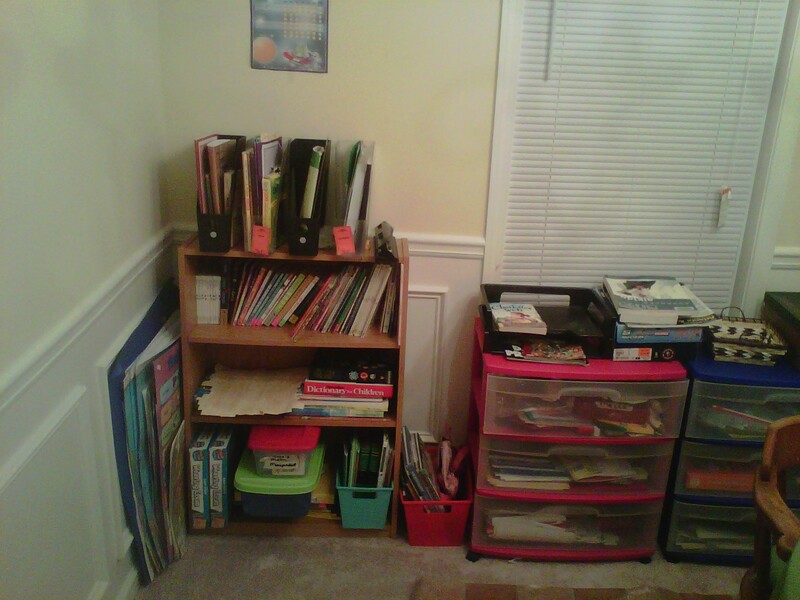 If you dont have much space maybe you can turn a closet into your storage for homeschool supplies and get some lapdesk or TV dinner trays for portable desk area. 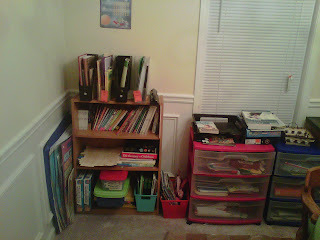 I also go the bookshelves from Walmart for between 15- 20 dollars. Thanks for commenting.